Getting old doesn’t have to mean giving up fun and social activity. 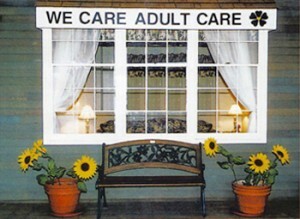 Just ask any of the We Care Adult Care, Inc. Member’s. Our members laugh, learn and reminisce in our cozy, home-like facility in Middletown, NJ. They thrive mentally and physically, regardless of their condition, as they make new friends, socialize with peers and enjoy catered lunch, visit our beauty parlor and plenty more. We Care Adult Care, Inc. is a safe, positive, caring alternative to in-home nursing care for those who do not need 24-hour skilled nursing. Our programs help people stay mentally and physically active, which reduces isolation, improves their health and self-esteem and prevents decline of their abilities. Our participants typically spend three to five days a week with us, based on their individual needs, which gives the caregiver valuable time to do the things he or she needs to do We also provide clean, comfortable door-to-door transportation (if needed) in our customized bus. The busy days at our adult day care center are filled with therapeutic activities such as art, singing, age-appropriate games, health monitoring, social work, meals and dietary counseling, as well as physical, occupational and speech therapy. And We Care Adult Care, Inc. works hard to make it all affordable, by helping you with available grants and insurance funding. To make an appointment, call 732-741-7363. Common types of services are listed below, as well as questions that may help you determine whether a specific day program fits your family’s needs. Interaction with other participants in planned activities appropriate for their conditions. Our friendly, conscientious bus drivers transport and assist the participants with door-to-door service. Member’s are provided meals and snacks, including those with special dietary needs. “We Care Adult Care” serves continental breakfast and a hot nutritious lunch specifically planned by our Dietician (included with your day rate). Our shower room is a big plus for those busy caregivers whose homes are not handicap accessible and for those that bathing has become a challenge. We offer beauty and barber services including washes, cuts, blow dry and perms, every Wednesday in our facility. Exercise and mental interaction for all participants.